We are a leading Manufacturer of glass heat exchanger from Vadodara, India. We are one of the reputed organization engaged in manufacturing of a wide range of Glass Heat Exchangers. Made using superior quality glass, these products offer high performance and are easy to install. 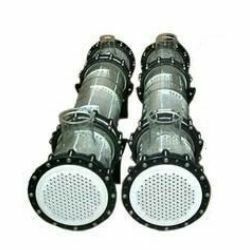 Shell & Tube Heat Exchanger is a new invention which is widely used in various industries for heating, cooling, condensation and evaporation of liquids. These heat exchangers offer excellent heat transfer because the smooth glass surface does not occur fouling. We manufacture these heat exchangers in various combinations of glass, metal or FRP. Backed by a team of expert professionals, we manufacture Coil Type Heat Exchanger which finds applications in air conditioning, refrigeration, space heating, power plants and chemical plants. Our products are available in various types such as boiler, condensers and immersion. These are highly durable and have the capacity of heat transferring upto 12 m² areas.